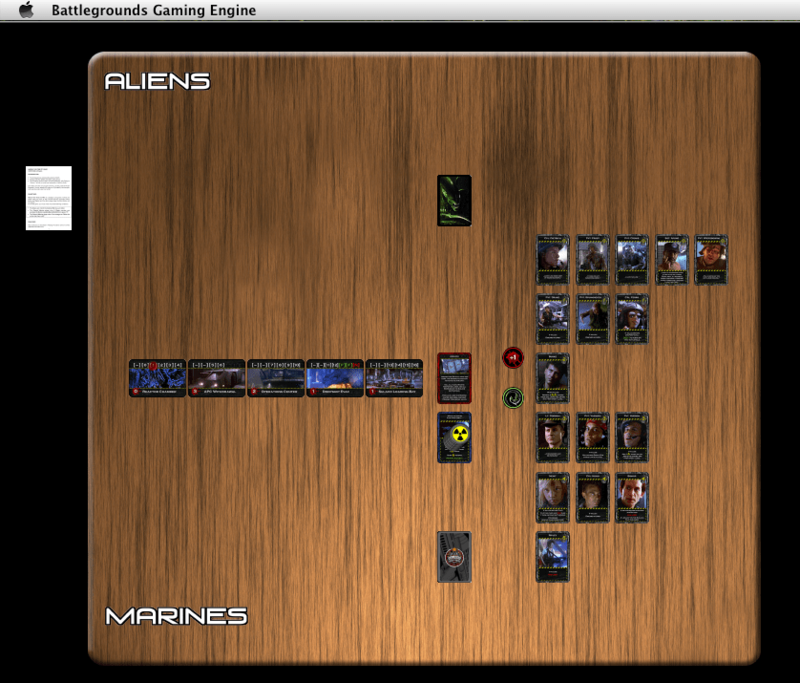 This is a BGE digital conversion of the “Aliens: This Time It’s War” card game, by Mark Chaplin. 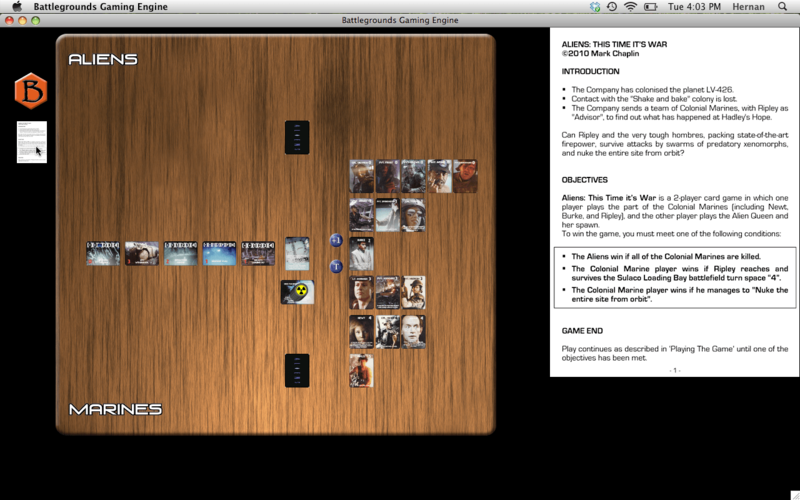 “Aliens: This Time it’s War” is an unauthorized, non-profit, and non-collectable card game based on the hugely influential 1986 sci-fi film, Aliens. White Goblin Games has licensed this game’s mechanics and will be publishing a re-themed version of the game called “Revolver: The Wild West Gunfighting Game” later this year (look here for more info). 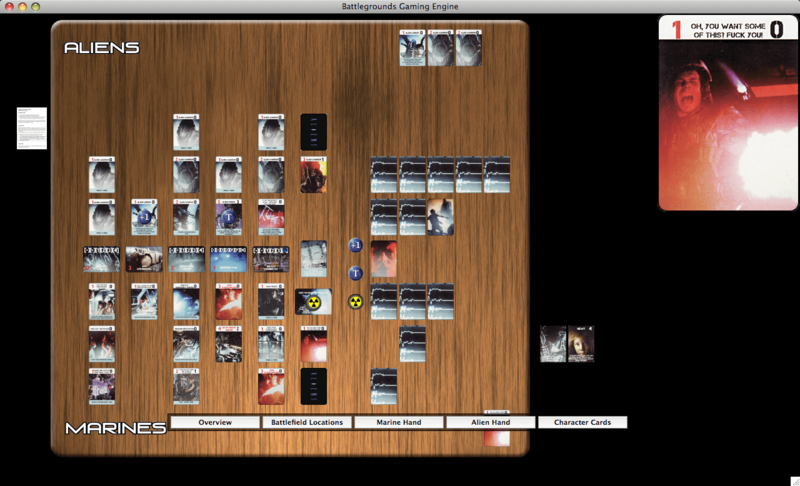 Consisting of two balanced 60-card decks, the game pits two players against each other in a life or death struggle. One player takes the role of the Colonial Marines, and his opponent assumes control of the hordes of deadly xenomorphs. 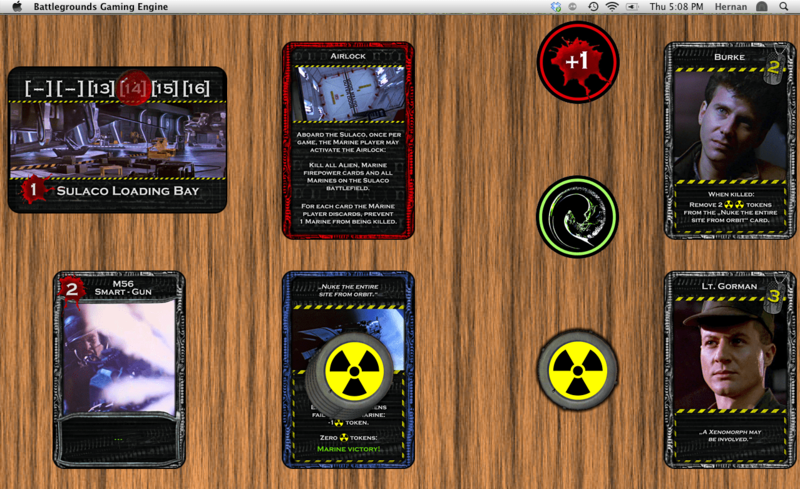 The Alien player’s objective is to eliminate all the Marines, before they escape the planet and “nuke the entire site from orbit.” The game has an asymmetrical design, with both decks featuring different cards and abilities. 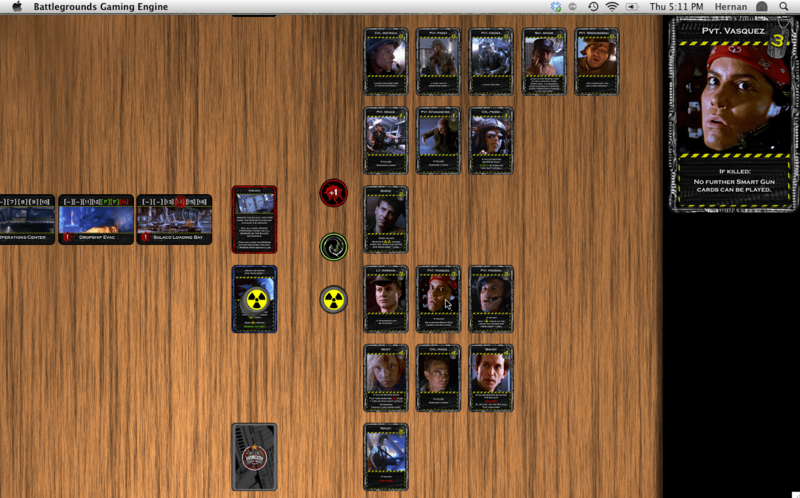 Please note: This game is strictly for adults – with profanity on many of the cards. The above download contains everything needed to play the game if you already have at least one Gamer Client license (BGE v1.5 or higher). For multiplayer games, the extra players will need a Gamer Client of their own, or they can play using the free BGE Demo if the host has enough free Player Slots available for them to use. Installation instructions are included in the download, and the game rules are included right in the digital conversion. 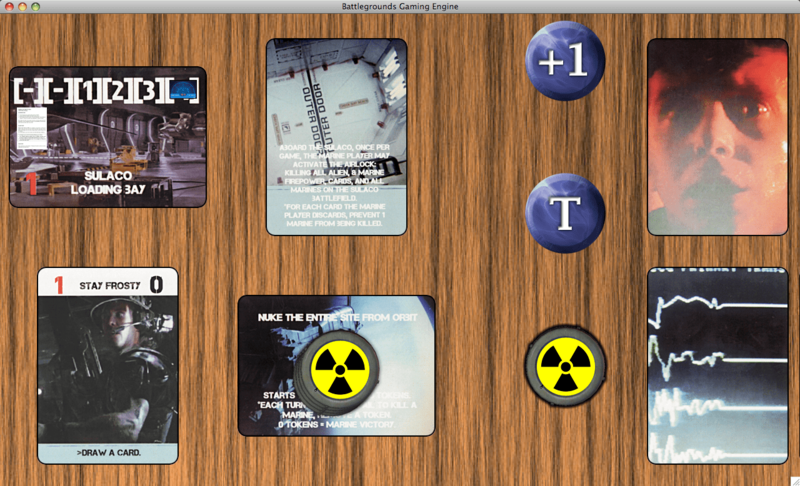 Some very nicely redesigned cards for this game were posted recently on boardgamegeek by Lines J. Hutter (aka Lines42), and I decided to use them (with his permission, of course) to release a new version of this digital game conversion. 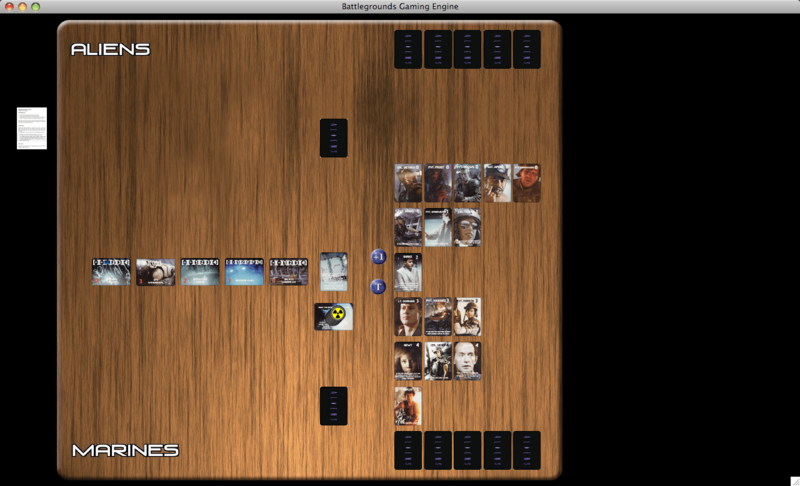 This is a fun, fast-playing game, well deserving of a graphical facelift. 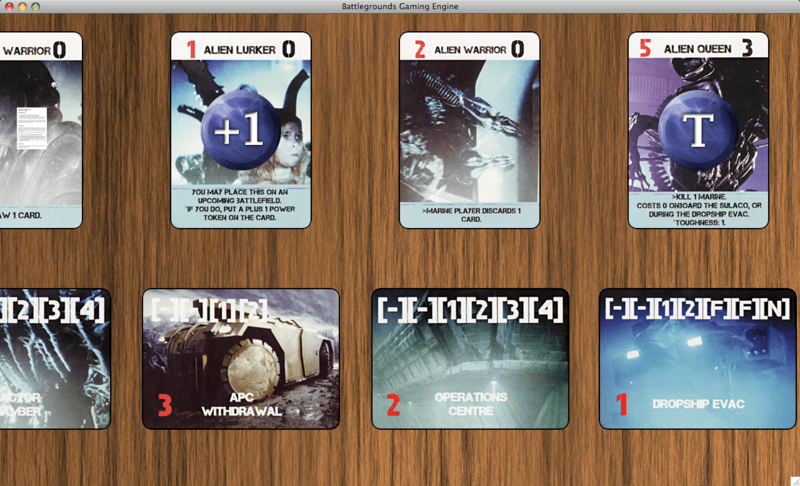 Here are some screenshots of what the redesigned game components look like.